In light of the Florida school shooting, local students are taking action in the event of a tragedy. Hundreds gathered on Monday to go over ways to protect themselves. NBC 5's Chris Hush reports. Many school administrators can't recall too many times when entire student bodies came together on one issue. On Monday, hundreds of students had open ears and an audience ready to listen. High school students from around the Chicago area told their school administrators, police chiefs, lawmakers and peers what change they want to see. Around 400 students from 30 Chicago-area schools spoke out under one roof at Willowbrook High School. The students are a part of a growing movement since the mass shooting at a high school in Parkland, Florida last month. "We are students," one teen said. "We will be voters. We are change." Another student said schools need more drills to help students stay safe. "We don't have active shooter drills, we don't know what it's like if we're stuck in a hallway or during a passing period," another said. "We are at the point where we want to be heard," Willowbrook High School student Sebastian Berlin said. "We don't want to wait anymore. We're tired. We're fed up." "I feel bad that it had to have another tragedy for me to speak up," said Adriana Gutierrez, an Addison Trail High School student. "I just don't want it that, it has to hit home in order for our voices to be heard." Their audience--all adults and in positions of power--were listening. That included Sen. Tom Cullerton. "I hesitate to use the words kids," Cullerton said. "If you saw their forum today, these weren't kids talking, these were actual involved citizens." "Whenever you give 14- to 17-year-olds an opportunity to have a piece of the conversation they will always surpass our expectations. From gun control and mental health, to arming teachers--their audience responded--even to the toughest questions. "I just don't know that we're at a place where arming teachers is a great answer to this situation right now," Villa Park police Chief Mike Lay said to student applause. Anything is possible now that their voices are being heard, the students say. "A month ago we weren't expecting ourselves to be in this situation," Berlin said. 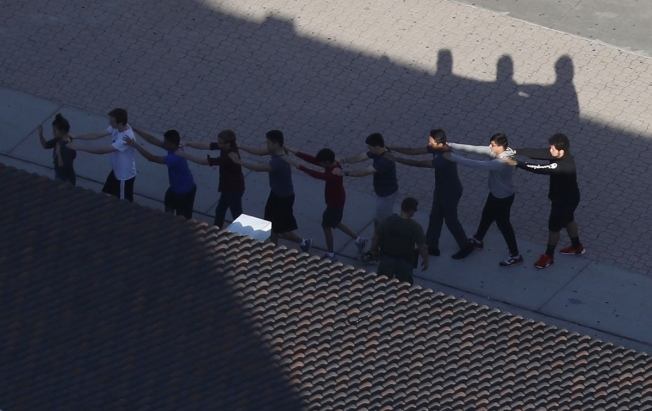 "In the one span of the one month we've had from parkland to now, look at what we've done." The forum came just days before a planned nationwide school walkout on the anniversary of the mass shooting at Marjory Stoneman Douglas High School in Flordia. Many schools, but not all, are supporting--though not promoting--the walkout, as long as it's done peacefully.